This is a sponsored post written by me on behalf of Bona for IZEA. All opinions are 100% mine. When we moved into this house, we were horrified to find carpet in the dining room. Not just carpet – WHITE, FLUFFY carpet. The kind you just KNOW will be a “bish” to clean if you ever drop anything on it. And you’re gonna drop stuff on it. Because it’s the dining room. Where people eat. And where babies LEARN to eat. We lived with it for a year. We got a rug to protect the carpet. I don’t know why… we spent hundreds of dollars on a rug we love, so we could stain that instead of a carpet we don’t care about. Then we were even more careful, because we loved the rug. Then, as our youngest neared 6 months of age, we (I say we but I mean I, the mom) got more and more nervous, picturing sweet potatoes flinging to the floor, mashed avocados, meatballs, everything you can imagine… all on the floor around that high chair. So we did something crazy. In this house we don’t even own. We ripped up the carpet and installed wood floors. And let me tell you, I’ve never been happier to clean floors in my life. Just having a place we CAN do things like eat, paint, dye easter eggs, and more, without worrying constantly about staining the carpet. With Bona PowerPlus, the floor is super easy to get really clean. I just use the oxygen-cleaner spray (bubbly action works really well) and the microfiber cleaning pad. I’m glad it’s so simple, because I have to clean it often… it’s also where my dog comes in from being outside, so there are lots of pup paw prints, especially if the sprinklers have been on. I thought I could use my usual standby, vinegar and water, but it can actually strip and damage wood floors over time, so it was a no-go. The Bona® cleaner is great though! Bona PowerPlus is their most powerful cleaner yet. You can enter the Bona PowerPair Sweepstakes by buying the cleaner and the mop – available at Lowe’s, Bed Bath & Beyond, ACE Hardware, and True Value. You have GOT to check out the prize pack – it’s kind of amazing and I would love it! Your house would be totally decked out. And even if you don’t win the sweepstakes, you still win, because 1) You have a wood floor to clean in the first place – WAY nicer than carpet – and, 2) Bona’s spray and microfiber mop makes it easy to maintain your floors every day. 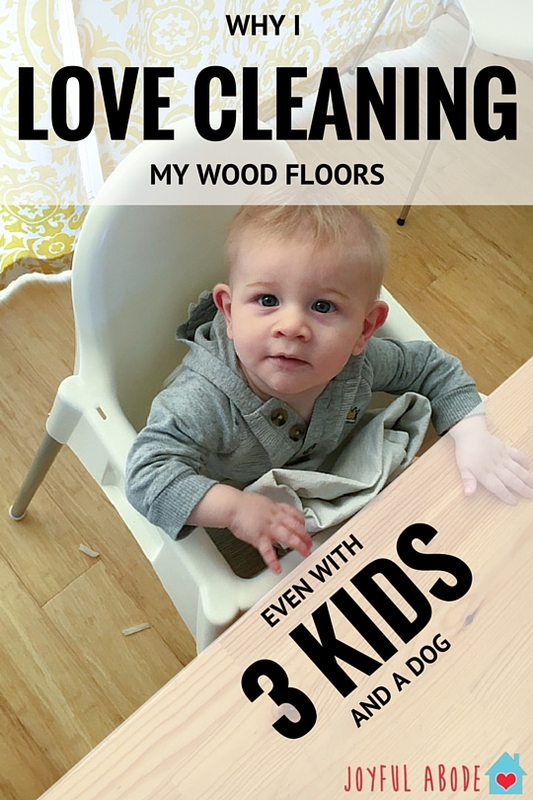 And that’s why I’m super happy to clean my wood floors. If you mix too much vinegar into your cleaning solution, you can actually end up damaging your floors, like you said. I’ll definitely have to give this spray a try! Thanks for sharing! Hi! I'm Emily Chapelle, and this is my family. 5 years ago, I worked hard to simplify and streamline my homemaking, so that I could spend more time, energy, and focus on the people who really matter most. And that's what I've been doing ever since. Now, I'm excited to help you do the same! Learn more about me and this site on my about page, and join my free Declutter Squad facebook group below. Emily Chapelle / Joyful Abode is a participant in the Amazon Services LLC Associates Program, an affiliate advertising program designed to provide a means for sites to earn advertising fees by advertising and linking to amazon.com .